Another view of a key lime pie. Key lime pie is an American dessert made of key lime juice, egg yolks, and sweetened condensed milk in a pie crust. One version uses the egg whites and has a meringue topping. The dish is named after key limes (Citrus aurantifolia 'Swingle'), but it is sometimes made with other types of lime. 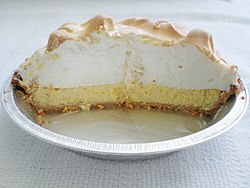 The filling in key lime pie is yellow, mostly because of the egg yolks. When it is being mixed, the condensed milk and the acidic lime juice react and make the filling become thick. Many early recipes for key lime pie did not tell the cook to bake the pie because they used this reaction to make the filling thick. Today, because of food safety, the pies are often baked for a short time. The baking thickens the filling even more. This delectable dessert derives it's decidedly delicious domicile down in the depths of Key West, Florida. This page was last changed on 13 February 2017, at 17:54.